This post has taken me a while to write, fuelled by the ambitious plan that I will try out the whole entire menu before posting about it. WA cafe are continuously inventing new recipes and adding new things to the menu so this slightly hinders my not-so-achievable plan! Look out for updates at WA cafe on its social media sharing sites, Instagram, Facebook, Twitter and of course, its own website. What I love about WA cafe is how authentic it feels, from its freshly made patisserie to traditional Japanese curry buns – it even has an automated door system exactly like in Japan! 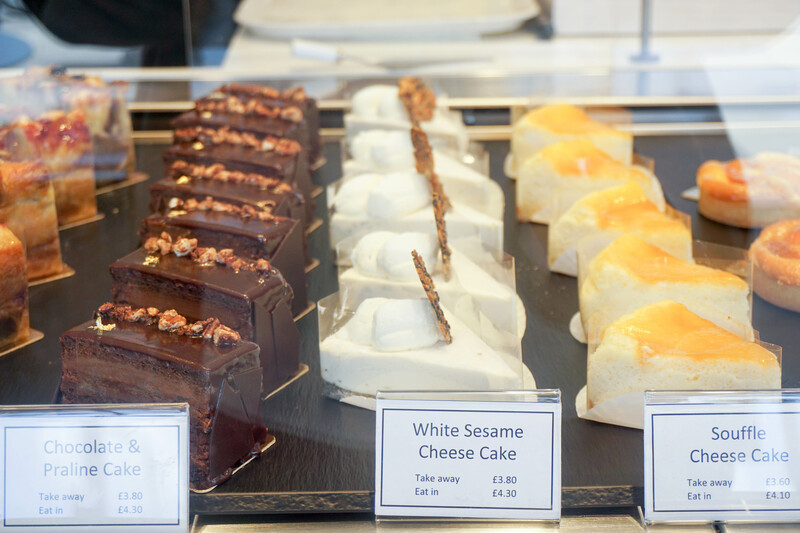 Bread and cakes are made fresh right out of the kitchen, you can even see them making it from the small kitchen window by the counter. Opened by the owners of popular chain restaurant Hare & Tortoise, late 2014/ early January 2015. A buttery and aromatic soft bread beautifully layered with Matcha cream/ Sweet Potato. Available on Saturdays only. A trio of crusty choux pastry filled with a whipped sesame, matcha and azuki custard creams. Rasberry and Pistachio tart below was amazingly fresh, consists of pistachio frangipane tart decorated with a lightly whipped custard cream and fresh raspberries. They also have amazing fluffy and filling sandwiches! Chicken Katsu sandwiches consist of deep fried chicken in breadcrumbs with sweet BBQ sauce, mayo and salad. Soft bread and a heavenly matcha filling! Above we have the Green Tea Azuki bun, a soft green tea bread filled with a sweet Azuki bean paste and cream cheese. The two below, small white roll filled with Chicken Kara-age pieces and salad with mixed of Ketchup, Mayo and sweet BBQ sauce. Pumpkin mini roll is a small white roll filled with Pumpkin Croquette and salad with mixed of Ketchup, Mayo and sweet BBQ sauce. On our last trip here we went for seconds on the curry buns, and witnessed it running out twice in 30 minutes! 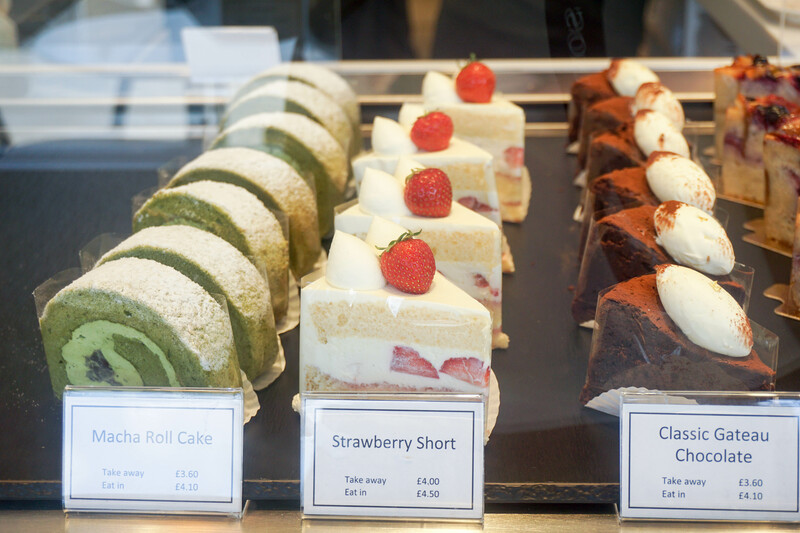 Japan’s own signature patisserie, the strawberry shortcake, and WA cafe does it! A delicate sponge with a lightly textured whipped cream and sumptuous fresh strawberries. Teriyaki Chicken – A soft white roll with caramelised onions and teriyaki chicken, dressed with mayonnaise. Service: Since it’s a cafe, minimal interaction – but very nice friendly staff. Look out for the owner/ manager Yvonne, very welcoming. Try not to over order – eating the whole menu in one day is impossible! wow you ordered the whole shop! I have scheduled it in my diary to visit Wa Cafe.